Mondays – Koffee & Kids at Calvary from 9:30AM to 11AM. Coffee, donuts, and conversation will be waiting for you! Click here for more information. Fridays 11AM – 12PM – Yoga for Beginners with Alene Brennan at Covenant. For more information about either Yoga Series, please visit MettaMind’s website for more information. Tuesday, April 23rd – VBS Planning Meeting. Please contact Sarah Wood if you would like help out this year! Vacation Bible School will run from July 29th to August 2nd. Friday, April 26th, Saturday, April 27th, & Sunday, April 28th – The Burlington County Entertainers Present “Songs of the 70s.” Come on out to Burlington City HS and enjoy our very own talented Calvary singers for a night of music by Carole King, Stevie Wonder, Bee Gees, Bette Midler, and more! Tickets are just $10 and can be purchased at the door. Proceeds benefit Deborah Heart and Lung Center. Tuesday, April 30th – Chief Ditzel from the Burlington County Sheriff’s Department will preset “Senior Safety & Services” at 10:30AM at Covenant. Lunch will be provided following the program. This event is FREE of charge. To register, call Covenant’s Church Office at (856) 829-7522. 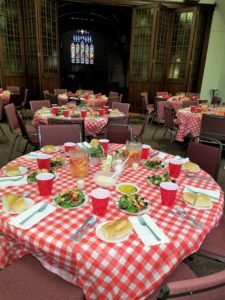 Sunday, May 19th – Spring Tea at Calvary! Join us at 2PM for an afternoon of High Tea with your loved ones and view a gorgeous display of vintage wedding dresses on loan from a local private collection. Tickets are $15 each and must be purchased in advance. Please email ChurchOffice@CalvaryRiverton.org to purchase tickets. The proceeds from this event will help fund our new Youth Group. Sunday, June 9th – TED Talk at Calvary Presbyterian Church from 6:30PM to 8:00PM. TED technology entertainment and design are lectures that last 5 to 18 minutes. Please email jdbuck82@gmail.com to confirm your attendance. 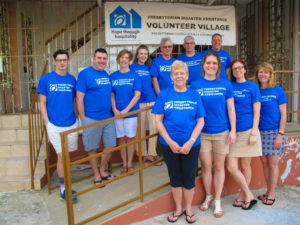 Our MettaMind Community consisting of members from Calvary and Covenant Presbyterian Churches recently went to Puerto Rico on a Mission Trip to help with the Presbytery Disaster Relief. Please click here to view some photos from that trip. Calvary hosted an Authentic Italian Style Dinner complete with live musical entertainment. Check out our Facebook Page for more photos from this fun night.